Mantic has launched (and already successfully funded) their next Kickstarter campaign. 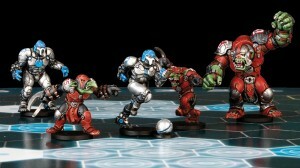 This one's for Dreadball, their fantasy (sci-fi) sports game. Dreadball is a two-player sports board game set in our Warpath universe where two coaches compete to outscore each other and win at all costs. The game comes complete with a fantastically detailed full-colour pitch, two complete teams, a roster pad to keep a record of your team’s development ( yes – league play is included) plus counters, event cards, and dice – all packed in a beautiful high-quality box. We're launching DreadBall through Kickstarter where with the help of the community we hope to be able to include the referee figure, alternative sculpts and more players in the box, as well as create new teams, introduce new expansions and create a strong community so you’re always supported!